The summer of 2017 brought unprecedented wildfires to BC’s Cariboo region. Hundreds of ground and aerial firefighters were brought in to battle the blazes. For firefighters in the air, wildfires create unpredictable flying conditions that can test their skill and put them at greater risk of accidents. It all started when Conair Aviation, an aerial firefighting company based out of Abbotsford, BC, wanted to develop better fatigue and risk management systems for their pilots. 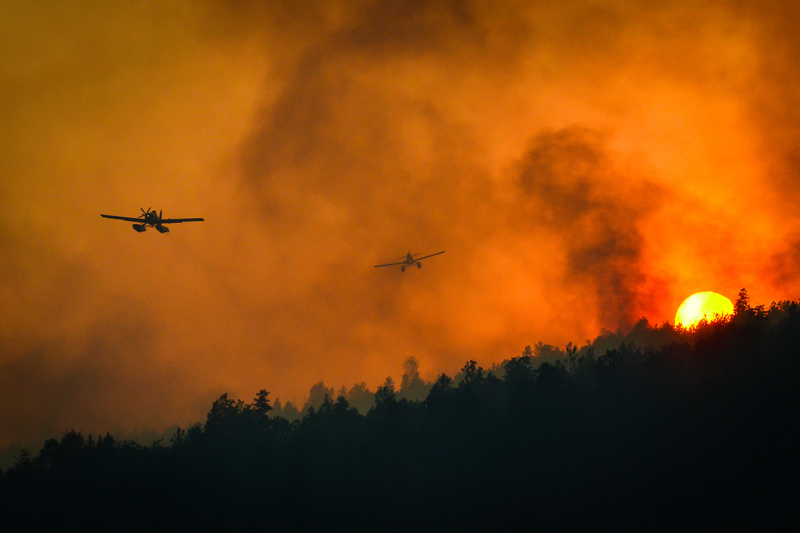 They wanted a system that could give the pilots another way to monitor their stress and fatigue throughout the fire season and enable the Conair team to mitigate the risks associated with them. Long flying shifts and high-stress wildfire scenarios can push pilots to the brink, jeopardizing their personal safety. They partnered with researchers from UBC Okanagan and Camosun College for a series of multidisciplinary Mitacs internships, coordinated with help from the Consortium for Aerospace Research and Innovation in Canada (CARIC). Victoria-based Latitude Technologies was also brought in for their expertise in monitoring the plane’s equipment for stress during the high-stakes conditions of a wildfire. One of the researchers on the team is Marie O’Brien from UBC Okanagan. Marie is applying the latest research in computer algorithms and data analysis to wearable technologies, including a technique called fuzzy logic. Fuzzy logic is an approach used for complex problems involving human reasoning as it allows researchers to develop an algorithm based on “degrees of truth” rather than the usual “true or false” that computers use to make decisions. “Fuzzy logic provides a method to manage the pilots’ physiological and cognitive data and estimate the pilot’s performance,” Marie explains. A device collects info such as the pilot’s heart rate, flying time, and fatigue; meanwhile, other onboard instruments monitor flight duration, altitude, and airframe stress. By applying fuzzy logic using the data collected from the technology, the pilot can glean better information to decide if they’re still in top physical condition to fly. The completed system will monitor pilot’s cumulative stress, and, in conjunction with the operations team, can alert the pilot if it’s time to return to the ground. This will help Conair Aviation manage pilot fatigue during the fire season based on the pilot’s actual workload. The current federal aviation regulations manage fatigue based on sleep research only and require pilots to have forced rest days. “What often happens, in our case, is that we are forced to ground rested pilots when they should be out flying to maintain their flight currency during water-bombing procedures. This is one of our biggest safety concerns in aerial firefighting. The safer approach would be for us to manage the workload, rest and stress with each pilot as well as our whole fleet team. “This technology will allow pilots to monitor their levels of alertness or general health and participate in their own fatigue management. It’s a far more realistic approach to managing fatigue during the firefighting season,” says Leigh Barratt from Conair Aviation.